Now for kids! 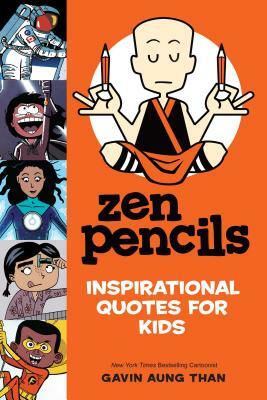 Based on the adult New York Times Bestseller, Zen Pencils: Cartoon Quotes from Inspirational Folks, this special editon for children will inspire them to reach for the stars! Explorers like Amelia Earhart and Chris Hadfield. Pioneers like Marie Curie and Margaret E. Knight. Modern icons like John Green and the Dalai Lama. These are only a few of the trailblazers you’ll meet in this collection of cartoons and quotes. Let their words of wisdom lead you to greatness, reflection, and discovery. Each inspiring quote is transformed into a compelling story that unfolds before your eyes. Follow the illustrated adventures of dragon slayers, warrior monks, ballet dancers, and professional wrestlers—all while hearing from some of the great voices of our past and present. Now for kids! Based on the adult New York Times bestseller, this special edition for children will inspire them to reach for the stars.